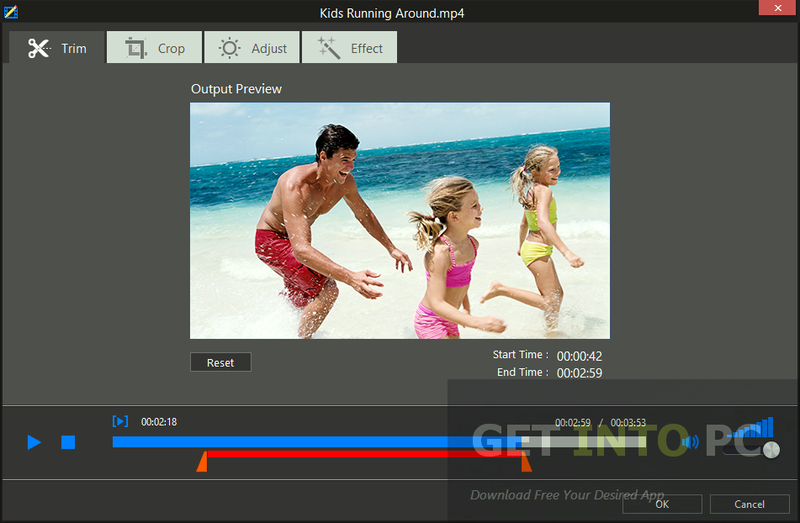 Video Converter Pro Free Download Latest Version for Windows. 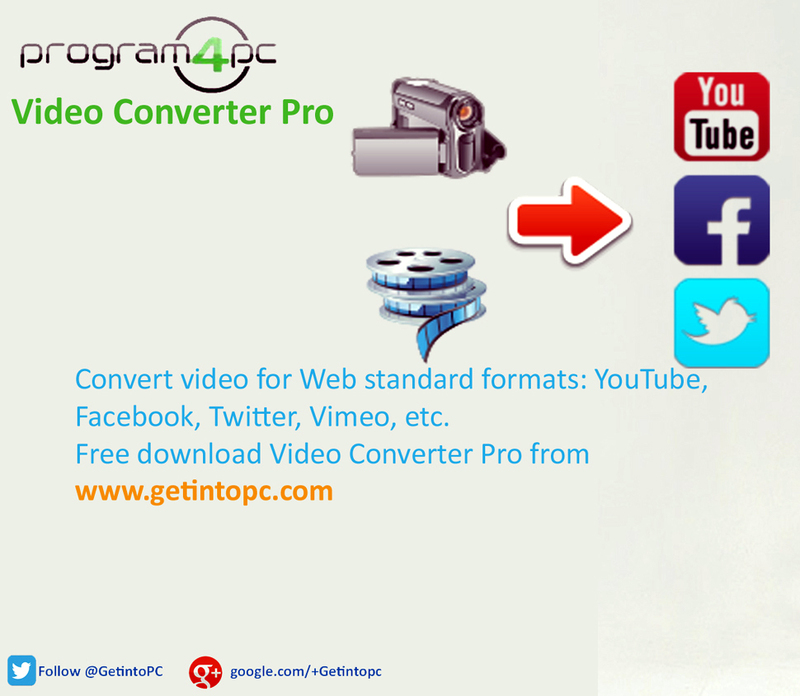 It is full offline installer standalone setup of Program4PC Video Converter Pro for 32Bit and 64 Bit PC. Now are the times when information is floating all around us in different forms. You can have information of anything you required in the form of a text file, an audio clip or a video clip. There are different devices available to access the information. Gone are the days when people used to switch ON their TV sets for watching the latest news or for having a quality time with family by watching a TV program or a movie. Now you can have access to any video content at any time on any device. You can watch your favorite musical video or a movie on your handy. Different devices need different formats of the videos so that you can enjoy the content on a specific device. 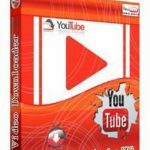 There arise a need for a file converter that can convert videos from one format to another which is also known in common terms as video converter. There are lots of video converters all around us and there is a tough competition going on between them. In this competition all the companies are trying to improve their product so that they can survive in the market. Now a days a video converter is not just a video converter but it also has some extra features like video editing options. Customers and users are extremely satisfied with this software, their reviews can be read here. 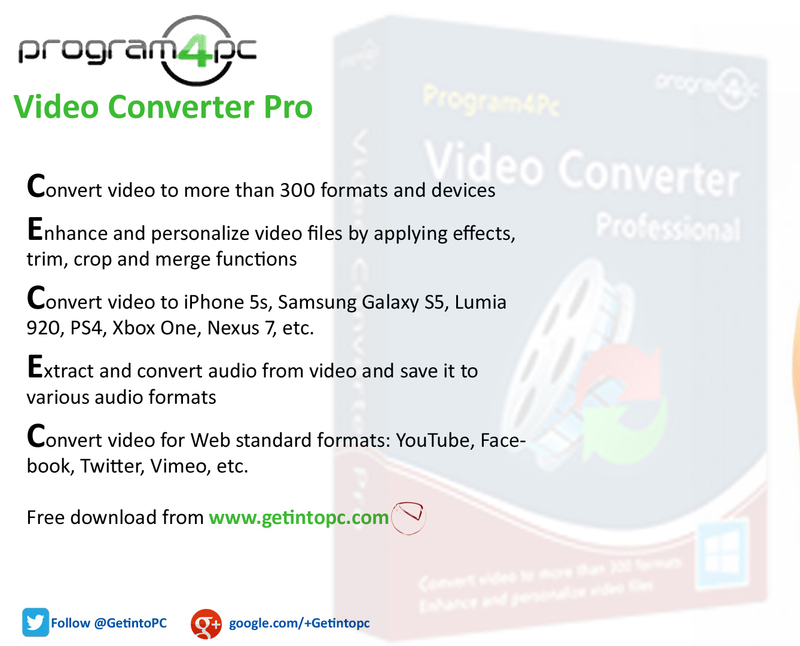 Video Converter Pro developed by Program4pc is an application that can be used for converting a wide array of videos into different formats. 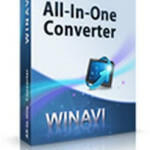 This converter is considered as super fast converter. Now how did Video Converter Pro has managed such super fast conversion speed? Well there are few factors due to which this application has managed to convert the videos quickly. 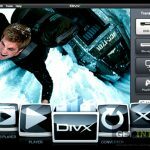 This application detects the CPU automatically and optimizes the video conversion. The application also supports Batch processing which means you can convert several videos simultaneously. This results in saving much of your precious time by speeding up the process. The conversion process is quick and the application also supports almost all the formats which means you can convert the videos in all the formats like 3GP, MP4, FLV, MPG and MKV etc. As described earlier it is the world where only the fittest can survive and in the field of video conversion software products now a days a video converter that just converts videos is not what people want you need to put in some extra features like video editing tools. 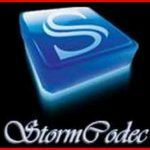 Video Converter Pro has this in its mind and it offers some stunning tools for editing the video file. You can remove the unwanted portion from your video by trimming your clip. With its Trim and Crop features removing unwanted portions is a piece of cake. All you need to do is to select the area you want to retain in the video and with just a few clicks the portion outside the selected area will be removed. The video to be converted can also be split into several parts as well as different video clips can be merged into one clips. Different effects can be applied to your video in order to give it more spicy looks. There are several predefined effects included in this application. You can turn your video into black and white, can set the hue and contrast of the video you give it a new look. 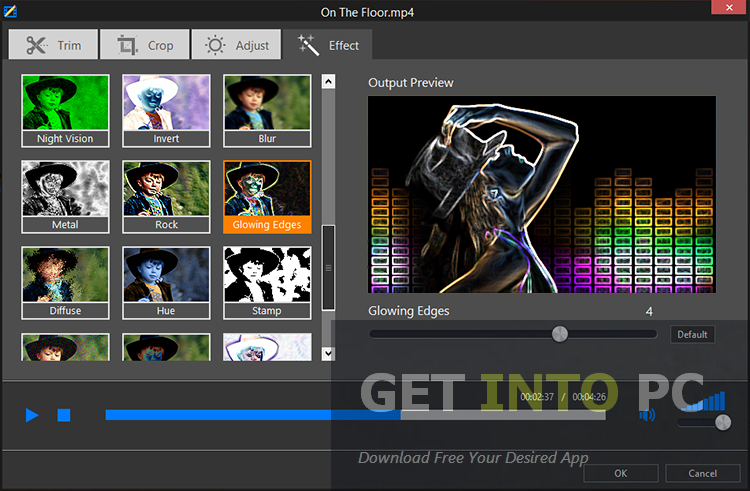 The audio stream can be easily extracted from the video clip. The extracted audio clip can then be saved in to any of the audio file format like mp3, wav, acc and ogg etc. Within no time you can convert your videos into different web formats so that they can be easily uploaded to websites like Vimeo, Dailymotion, Facebook and Twitter etc. The videos can also be converted into the formats that are supported by smartphone. It has the ability to convert videos for the latest Apple iPhone 5S and Samsung Galaxy S5 versions without losing the quality and crispness of the video. 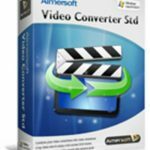 All in all Video Converter Pro is a complete package for not just converting the video into different formats but also for editing them at your own will. Below are some noticeable features which you’ll experience after Video Converter Pro free download. Supports almost all file formats. Details are here. Fast conversion of videos from one format to another. Trim and Crop feature included for removing unwanted material. 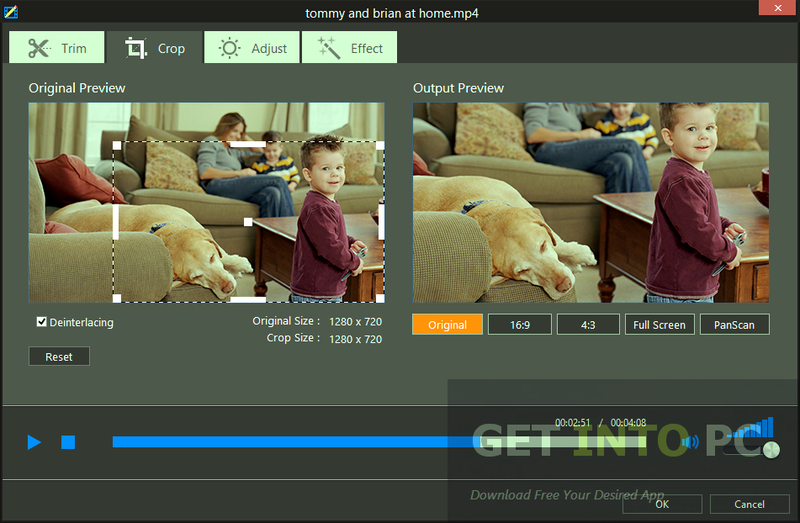 Audio stream can be extracted from a video file. Can split the video into different portions. Can merge several clips into one unified clip. Can apply any of the predefined effect on your video. 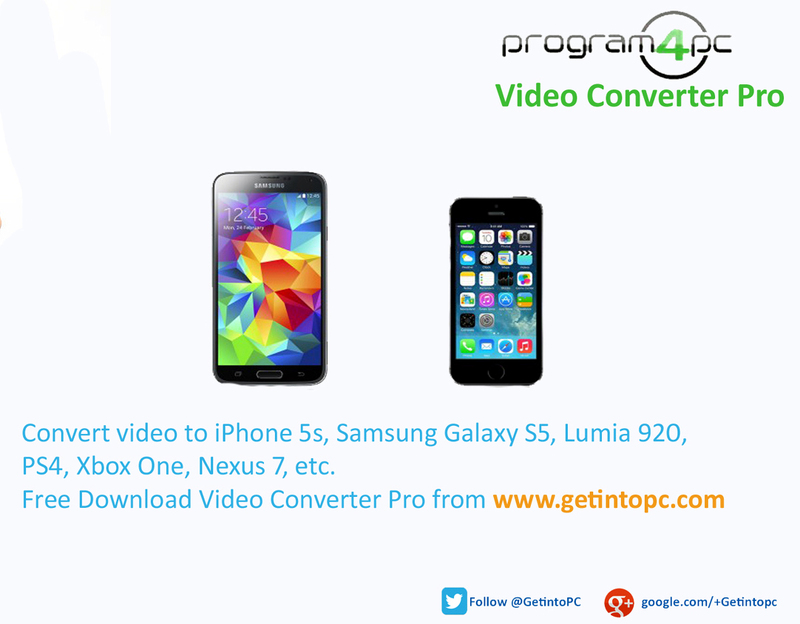 Can convert videos for iPhone 5S and Samsung Galaxy S5. Can convert videos into different web formats for Dailymotion, Vimeo and Facebook etc. Before you start Video Converter Pro free download, make sure your PC meets minimum system requirements. Click on below button to start Video Converter Pro Free Download. This is complete offline installer and standalone setup for Video Converter Pro. This would be compatible with both 32 bit and 64 bit windows.